Some of you might remember when we covered the Callet, a Gel-Polymer covering for an iPhone that has pockets in the back for credit cards. The Hundreds X Hex Wallet is essentially the same concept, but a lot fancier. The Hex Wallet is a pocket sized phone holder with a leather cover with pockets for credit cards with an elastic strap to keep it safely closed. I have to admit that this is a pretty classy cover for the iPhone 4/4S. Especially with the “Jags” pattern that looks like funky alligator skin, not to mention the Adam Bomb graphic that you have to see for yourself. If you are like me, you might not know a lot about your car. If you are not the type who wants to trust in an auto mechanic, you might want to look into CarMD. CarMD is a simple device that plugs into the 16-pin Data Link Connector (DLC) that is usually found on the driver’s side of the vehicle. Once it is plugged in, running a diagnostic is as easy as turning the vehicle’s ignition on and the device does all the work. 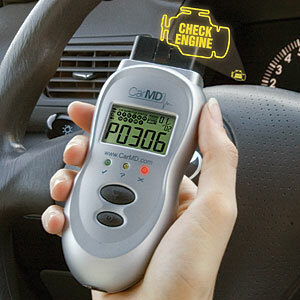 The CarMD includes lifetime software and firmware updates with free access to CarMD’s database. The handheld device can be plugged into a computer, and the software will generate a personalized Vehicle Health Reports. These reports reveal safety issues or recalls, and will be able to tell you what’s wrong with the car. It will even figure out the cost of parts and labor in your zip code. Considering that Halloween is about twenty days away, have you thought about a costume yet? Have you considered dressing up as yourself? The Japanese company REAL-f can help you as they have a 3-D printer that can make a very detailed replica of your face. They can print out everything from the skin tone, freckles, and eyebrows, and put them all on molded resin. Hey, if you and a friend want to go in together, you can dress up as…each other! Granted, the effect will probably be like putting a realistic mannequin’s face on your own, but it will leave people guessing. For those that need some protection from natural disasters, you might want to consider the Noah Disaster Shelter. I think the product is well-named, but it isn’t an ark capable of holding two of every animal on Earth. It can hold about four people. Apparently, there is a pole in the middle to hold onto, and there are pillows to keep one safe. I don’t have any word if there are any seat belts, but there should be. The idea is that you and three others get inside this thing, and it bobs to the top after the tsunami, earthquake, or flood goes over. I am assuming that once the big yellow ball bobs to the top, you can call for a helicopter to come pick you up. Once again, a device has shown up on the market that allows users to forget that they have charged their mobile devices instead of forgetting to charge them. This type of charger does sit on your desk, but it is a bag that you take with you. This is the Powerbag Messenger by Ful, and it allows you to charge your tablet, smartphone, iPod, or other mobile devices. The secret is the removable battery inside, that can be charged with the included AC cord. When the battery is docked with the cradle inside the bag, the user can check its battery level by hitting the power button. LED light indicators (four in all) reveal how much power is in the battery. The user can then hook up to the Apple connector, micro-USB, or mini-USB, which are conveniently located in the Messenger bag’s pockets. The battery even has a USB port for anything that is USB chargeable! There is nothing that I like more than a laser pointer, and Griffin Technology has a good one with the Stylus + Pen + Laser Pointer. As the name implies, this laser pointer has a pen and a stylus on it. There really isn’t anything too special about the pen, but the pen portion can flip around for a rubber-tipped touchscreen stylus. The stylus is good for when you want more specific touches on your touchscreen. Since a lot of gaming applications require precise touches in order to win, this stylus could come in handy on tablet games.